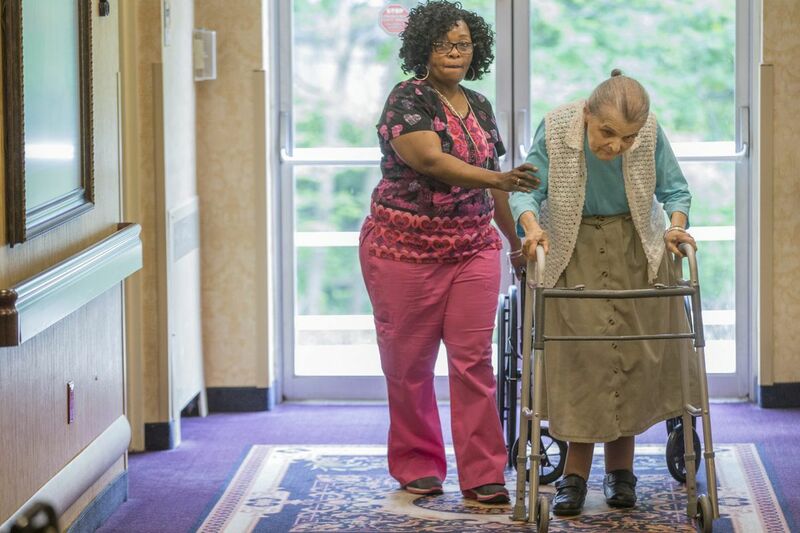 Nurse’s aide Theresa Alston, left, helps resident Ruth Haye, right, down the hall to make sure she gets her daily exercise at Brookside Healthcare Rehabilitation Center near Abington. Brookside Healthcare & Rehabilitation Center near Jenkintown provided 39 percent of the registered nursing a day expected by federal regulators during a recent three-year period. Advocates and some academics say that's a sign of a company out to boost profits. Not so, said Brookside owner Meir Gelley. "It's not about money. We don't mind spending the money. As you can see, we have a beautiful facility," he said. Gelley, who was one of just a few Philadelphia-area nursing-home owners contacted by the Inquirer who agreed to talk at length about staffing, said his company's staffing strategy benefited patients. "If I have a choice of having more people taking care of residents and giving more care, but it's by an LPN as opposed to an RN," Gelley said, he will use more licensed practical nurses to provide more direct care, and "the residents are going to do much better." For overall nursing care, which includes RNs, LPNs, and nursing assistants, Brookside's 4.1 hours per patient day easily topped the state minimum of 2.7 hours per day of care, but was well below the 4.9 hours a day expectation calculated by federal regulators based on the mix of patients at Brookside during annual inspections. "I don't think anyone is thinking of staffing at 2.7," said Ann Molesevich, vice president of operation for Gelley's company, Nationwide Healthcare Services. "The question is, Do we look to staff at a 4.9 because a CMS-driven calculation tells me I should be there?" The federal expectation is not a requirement. At Philadelphia-area nursing homes, where a common theme is that it is hard to find RNs willing to give direct care in nursing homes, the amount of nursing care varied widely. Some analyses focus on absolute levels of care, but Harrington and other experts emphasized the importance of taking the relative sickness of the patients at facilities into account. Philadelphia-area nursing homes provided fewer hours of RN care per day relative to expectations than of total nursing care. An Inquirer analysis of data from Medicare cost reports provided by SNFdata Resources LLC found that the median nursing home (half are above; half are below) in the eight-county Philadelphia region provided 71 percent of the registered nursing care expected by the federal Centers for Medicare and Medicaid Services based on how sick the facility's residents were during the annual inspection. The range was 15 percent to 341 percent. The median for total nursing hours was significantly higher, at 93 percent. The range for total nursing was 67 percent to 218 percent. Shareese Reynolds, an LPN who has worked in nursing homes for 20 years, said she has seen the gap between RNs and other nursing staff firsthand. RNs who serve as unit managers are sometimes counted as direct-care staff, but they don't give much direct care. "They are in meetings all day, and I believe they leave it up to LPNs to really do most of the work," Reynolds said. The Inquirer analysis, which was designed to capture the amount of nursing care provided throughout the year, not just during a brief period at annual inspections, was limited to 203 nursing homes in the eight-county Philadelphia area that had the same owner for the three-year periods, which ended Dec. 31, 2015, or June 30, 2016, depending on the nursing home's fiscal year. The table shows 203 Philadelphia-area nursing homes that had the same owner for the three years ended Dec. 31, 2015, or June 30, 2016. The expected RN hours per day per patient are three-year averages calculated from Centers for Medicare and Medicaid services data. The figures for actual RN hours are three-year averages calculated from Medicare cost reports. The star rating, a measure of overall nursing-home quality calculated by the Centers for Medicare and Medicaid Services, with five being the highest, is as of May 1. The table can be sorted by any column by clicking on the header. Numerous nursing-home operators objected to the use of the cost-report data to calculate staffing levels, arguing that regulators do not use the numbers that way. Some disputed the accuracy of their own numbers on the cost report. "It's true that CMS is not auditing them and there's no penalty given, so they don't have an incentive to report accurately," Harrington said. "But that doesn't mean they are not supposed to report accurately." Broadly speaking, data problems have long bedeviled the assessment of nursing homes' quality. Much of the information, including the data on the cost reports and most of the information used for CMS's five-star ratings, is self-reported, which causes researchers and advocates to doubt the data's integrity. That makes correlations hard to show, especially in a relatively small set of 203 facilities. "The problem is all these numbers are self-reported, so I don't feel that they are necessarily accurate," said Sam Brooks, a lawyer at Community Legal Services in Philadelphia. The public's view of staffing is expected to improve next year, when CMS starts publishing staffing data that come straight from nursing homes' payroll systems. Some operators said the numbers in the Medicare cost reports were accurate even though they showed very low RN staffing. Centennial Healthcare & Rehabilitation in West Philadelphia has low levels of RN care and total nursing care, but it scores well on the federal Nursing Home Compare website. Centennial Healthcare & Rehabilitation Center in West Philadelphia, for example, was tied for the second-lowest level of RN care, at 20 percent of the hours a day expected by CMS. "The data you have is correct, and the bottom line is the facility is achieving good outcomes," said a lawyer for the owner, Colev Gestetner. The latest Nursing Home Compare rating for Centennial, formerly known as the Stephen Smith Home for the Aged, shows that the facility has the lowest rating for RN staffing, but a five for quality. It had four stars overall. Chester Valley Rehabilitation & Nursing Center in Malvern provided just 15 percent of the RN hours per patient day expected by CMS, the lowest figure in the Inquirer analysis. Chester Valley also has a provisional license from the Pennsylvania Department of Health, which fined the facility three times in 2014 and 2015. Wood River Village in Bensalem provided the most RN care relative to expectations. Wood River Village, a continuing-care retirement community that has since been sold and is now called Juniper Village at Bucks County, got to 341 percent by relying almost exclusively on RNs, said Gerard McEvilly, who ran the 17-bed facility for the previous owners. It did not accept patients from the general public. "You had a very high RN-to-resident number, and the outcome was extremely good," he said. Leonard P. Haberman, a plaintiffs' lawyer at Clearfield & Kofsky who sues nursing homes for malpractice, also brought a different perspective to RN staffing: "Do you really need an RN to listen for the bell and come take Grandma to the bathroom? Do you really need an RN to reposition a patient to make sure she doesn't get a nasty bedsore? You just need people who care, and you need them to be trained." St. Martha Center For Rehabilitation & Healthcare in Downingtown was promising same-day job interviews last month, a move that was emblematic of the need for staff in nursing homes, where there is high turnover. That staffing picture could get worse because of the huge turnover in Pennsylvania nursing-home ownership in the last two years, said Matt Yarnell, president of SEIU Healthcare Pennsylvania, a union that represents 6,094 LPNs and nursing assistants in 108 nursing homes. "Because of the financial constraints, I think the first thing that's been happening is workers see their benefits eroded and they also are new operators and in no circumstance have we seen more focus on the bedside. It's really been trying to contain costs," Yarnell said. "There's a lot of turnover and a lot of agency [staff] being used in these buildings," he said. The table shows 203 Philadelphia-area nursing homes that had the same owner for the three years ended Dec. 31, 2015, or June 30, 2016. The expected total nursing hours per day per patient are three-year averages calculated from the Centers for Medicare and Medicaid Services. The actual nursing hours are three-year averages calculated from Medicare cost reports. The table can be sorted by any column by clicking on the header.